India has always been a home to architecturally and aesthetically appealing structures. Here are 10 ofÂ such marvelous constructions. We are also proud owners of airports that are completely green in energyÂ consumption. The airport in the port city of Cochin, is the first airport in India to completely runÂ on solar power while the Chandigarh airport is the first in the world to use green technology inÂ its construction. The lifelines of the metro cities, these rail lines started first in Kolkata in 1984 andÂ are now across the nation. In fact the Hyderabad metro rail project is the first largest project toÂ be undertaken as a partnership between private and public sectors. Once completed, it will alsoÂ become the largest elevated metro in the world. This solar power plant in the state of Madhya Pradesh, is the largest of its kind inÂ Asia. The plant is still under construction and is spread over a massive 800 acres. UponÂ completion, this project is expected to provide power to approximately 6.24 lakh homes. Connecting Agra to the capital, this road is the longest motorway inÂ the nation. Thanks to this expressway, one now donâ€™t have to spend 6-7 hours on road to reachÂ the Taj Mahal. It is just a mere 2 hour journey on the motorway. KPMG had listed this amongÂ the top 100 innovative projects of infrastructure in the world. This park has made Gujarat the largest hub of solar park in the continent.Â The park is spread across 5000 acres and it helps generate energy both from wind and the sun. ItÂ has been operational since 2013 with many different developers of solar and wind energyÂ hosting their projects here. The Indira Gandhi International Airport is the 34 th largest building in the worldÂ and the T2 terminal in Mumbai uses the same steel as the Eiffel tower in its construction. TheseÂ airports are both artistic and innovative. GIFT stands for Gujarat International Finance Tec and is under construction betweenÂ Gandhinagar and Ahmedabad. Upon completion, the place will host the regional and corporateÂ offices, trade centers, housing colonies with offices from IMF and UN along with them. AnotherÂ interesting fact is that it will use an eco-friendly cooling system. 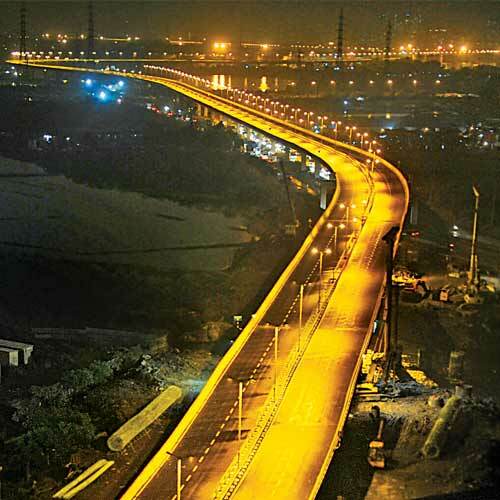 The second largest flyover in India, it connects two ends of MumbaiÂ and has been operational since 2013 supporting nearly 25000 vehicles every day. It has 8 entryÂ points for the commuters. It is the second largest of its kind in Asia and becameÂ operational in 2002. Apart from being a hub for nearly 2000 buses, it also has a huge parking lotÂ that can accommodate up to 2500 cars and two wheelers. The tunnel connecting Banihal and Qazigund areas of Kashmir is the longest railÂ tunnel in India and second longest in the continent. It took seven long years to construct thisÂ 11km long tunnel which has been working since 2013 now.